Dishoom does the ‘Indian Cafe’ experience very well indeed, and if you’re prepared to queue, serves some great tasting food and impressive cocktails. But if you want the echt rather than the ersatz, then head on over to the Somerset House side of the Strand and try and find the India Club Restaurant. 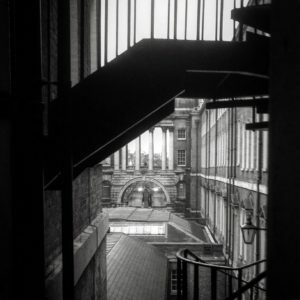 It must be 30 years since I was last here, but climbing the two floors – past the India Club bar and the Strand Continental Hotel reception on the first floor – and stepped into the room again, it was if I’d never been away. 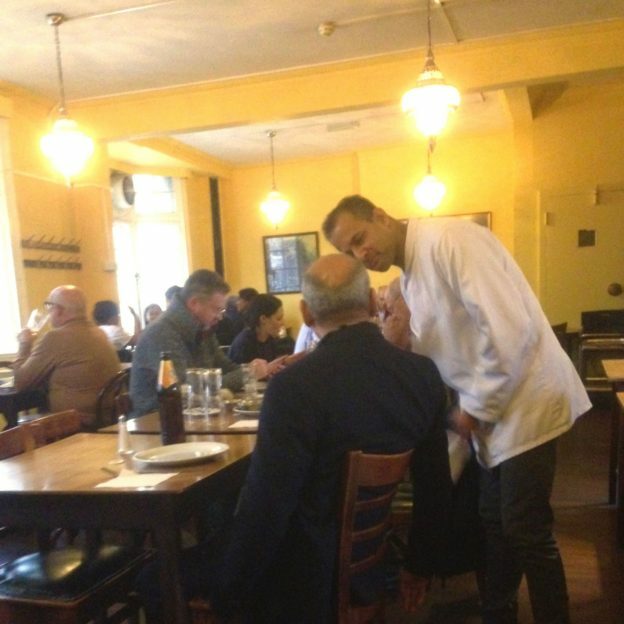 The brown Formica tables and the wooden chairs are almost certainly the exact ones I sat in in the 1980s (and probably the originals from the restaurant’s opening in the 1940s). The waiters were too young to be the same, but their white jackets and their welcome was exactly how I remember it. I’d made a point of rediscovering the place because of a news report that the Club (and hence the restaurant) is under threat. The lease is up and the landlords want to ‘modernise’, replacing what’s there with a luxury hotel (because obviously London doesn’t have enough of these). There’s a petition here that all right-thinking people should sign, to try to get Westminster Council to reject the planning application. There’s also a campaign to get the place listed for its culture significance. India Club was started by Krishna Menon, India’s first High Commissioner to the UK, with founding members including Lady Mountbatten and Jawaharlal Nehru. It was a meeting place for leading writers, intellectuals and politicians associated with India’s independence. To this day, it has retained it’s original features and still stands very much as it did in the days of the post-independence movement. It is a crucial part of the joint heritage of the UK and India. As well as the cultural loss, this would be another of London’s ‘cheap eats’ to go south. In recent years we’ve lost the Stockpot, Jimmy the Greek’s, the Pollo Bar; places where you could fill yourself up on home-cooked stodge along with the full spectrum of Londoners of all ages, ethnicities and classes. These are the places we miss when they’re gone, so use the ones that still exist while you still can. Truth be told the food at the India Club Restaurant is “good for the price” rather than an outstanding culinary experience (I had a masala dosa for £7), although the mango lassi is possible the most delicious thing I’ve drunk in the last ten years. 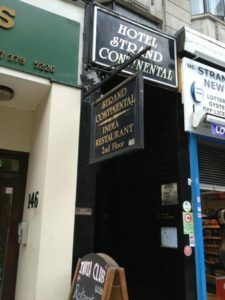 The India Club Restaurant is on the second floor of the Hotel Strand Continental at 143 Strand. Blink and you’ll miss the entrance. This entry was posted in London Icons, The Blog and tagged india club on 11/01/2018 by donbrown.